How Can *You* Stop Hearing Loss Bullying? “Be positive. Be nice. And be trustworthy.” Those are my 8-year-old daughter’s words…the perfect message to end hearing loss bullying forever. Someone shared an interesting story about a teacher who gave her students a writing prompt: “Can hate be stopped?” Nine out of her 10 students answered, “No, hate cannot be stopped.” Only one student answered, “Yes, it can.” That student, the teacher said, is the most bullied student in the school. How can we stop the bullying of people with hearing loss? Part two of my series, “Hearing Loss Bullying: A Troubling Phenonemon,” tackles this weighty subject. Read the first post in my series here. First, let’s visit a couple of people who have experienced hearing loss bullying themselves. “Two kids trapped my index, middle, and ring fingers of my left hand between the door jamb and crushed them by pushing the heavy oak door closed,” Melanie remembers. “I luckily didn’t break any fingers, although I did lose my fingernails and watched them grow back… Another girl said she wanted to kill me in seventh grade. 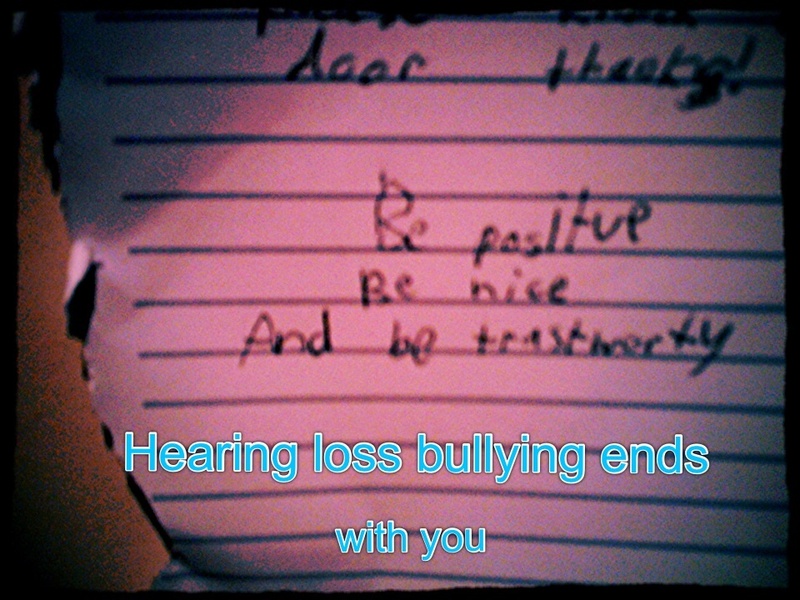 How can hearing loss bullying be stopped? “I will admit as a kid I was bullied, but I also did participate in bullying,” reveals Andy (not his real name). “There’s also a group mentality that takes hold of kids who might otherwise not have initiated any bullying on their own. We all might have made certain comments because we were in certain situations, but where did we get that idea from? “What’s interesting,” he says, “is that there has been bullying taking place even within the deaf and hard of hearing community. I remember kids making fun of me because I was a (sign language) cuer at a 4-H deaf camp. Looking back, I wonder how they came to find themselves in a situation where they felt the need to verbally attack someone who was different from them when we could logically assume they’ve experienced bullying of their own due to their hearing loss or communication preference. My ex-boyfriend told “me that I had selective hearing and that I was faking it,” writes Stacy (not her real name). “One day, he decided to only say everything once. That’s not very helpful when you are deaf. He wouldn’t repeat anything because he was sure that I wasn’t deaf. Lipreading Mom embraces Stacy’s idea of coming forward at school to share that she was bullied. I wonder if any bullies, upon reading Stacy, Andy, and Melanie’s stories, will also come forward to admit what they have done. Step forward to report all cases of bullying in schools, at home, and in the community. Look for opportunities, like Stacy did, to publicly speak out against hearing loss bullying. If you are currently experiencing bullying, report it immediately to a trusted adult or call 9-1-1. Don’t wait. Bullying begins for a reason. The bully’s story is as equally important in understanding as the victim’s is. Courage comes from investigating why bullying starts—to vent anger, to be popular, to have power—and publicly addressing these trigger factors. In bringing his bullying problem to light, Andy was able to see it for it was: a problem that needed to stop. More communities need to follow New York City’s lead in planning events that put a classy face on hearing loss. On February 26, New York’s Center for Hearing and Communication will host an Iron Man Poster Party. Guests are invited to get their picture taken with the Marvel Comics superhero, Iron Man, and receive a copy of the new Iron Man “Hearing is Believing” poster. It is an educational initiative from Phonak and Marvel Comics designed to reduce the childhood stigma of hearing aids. Let Lipreading Mom know what you think of the series, “Hearing Loss Bullying: A Troubling Phenonemon,” by commenting below. I did not develop hearing loss until I was twenty-five. I was bullied in high school for being “different” anyway. I was always grateful hearing loss was never additional ” fodder” as it had not developed yet. Bullying is cruel and adults who allow it (parents, teachers, and others) are just as guilty as the bully. We must all take a stand. Denise – We definitely should all take a stand. Be watching my next post on this very topic. I have always wondered why hearing aids don’t boost to specific lost, or diminished frequencies to fill in the gaps in a virtual Fletcher-Munson curve, and just leave the frequencies that are presently audible, alone. Well!! this is really a noble deed. Thank you for sharing. Rose I’m sure you’ve already found out by now or at least I hope you have. 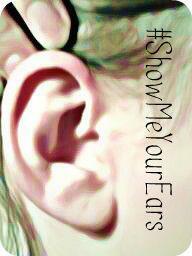 There are hearing aids that do what you have suggested. I was recently gifted such a pair from Costco. Ralph – That’s great news about your hearing aids! Thanks for commenting. In my experience, it’s generally a bit uncomfortable when I ask the voice of wisdom to amplify or be a bit louder. It’s significantly more pleasant when I am more quiet instead. Rose – Very good point! « Are You Bullied Because of Your Hearing Loss?